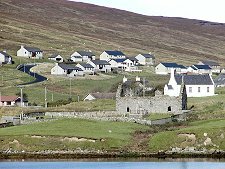 If Shetland can be said to have a central point, then Voe is probably it. From here two major roads lead north, the first to Brae and Northmavine, and the second to Mossbank and the ferry to Yell and Unst. Another leads south to Lerwick and Scalloway, while "B" roads lead west to West Mainland and east to Vidlin. The settlement here is old. The ruins of Olnafirth Kirk which is close to the east end of the Firth date back to 1714. 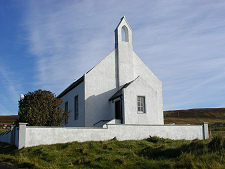 The spiritual focus of the community now lies only a short distance further back from the water's edge, at the striking white church that replaced Olnafirth. This east side of the firth is also home to much of the new housing that has sprung up since the 1970s oil boom, plus the village shops and other services. 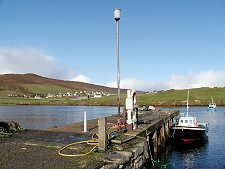 But the traditional centre and most attractive part of Voe is around the pier that projects into Olna Firth from its south shore. The pier was at the heart of a herring station that was set up here in the 1800s. 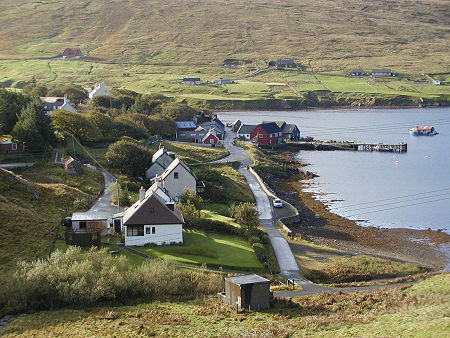 Olna Firth was also home to a whaling station operated by the Norwegian Whaling Company from 1904 until 1924. 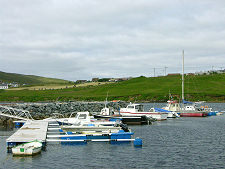 The pier has recently been extensively rebuilt to allow the development of a marina. Today this part of the village retains its strong Scandinavian appearance. The pier now also services fish farming in Olna Firth. 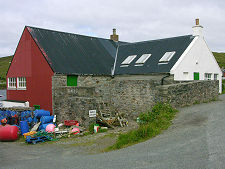 One side of its landward end is occupied by the workshops of the fish farming operation, while on the other is one of Shetland's camping bods. 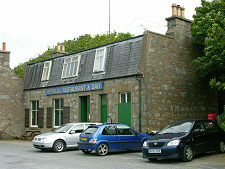 On the opposite side of the road is the Pierhead Restaurant and Bar. A little higher up and partly hidden by some of Shetland's few trees is the strikingly attractive Voe House, dating back to the 1700s and built for the tenants of the estate. 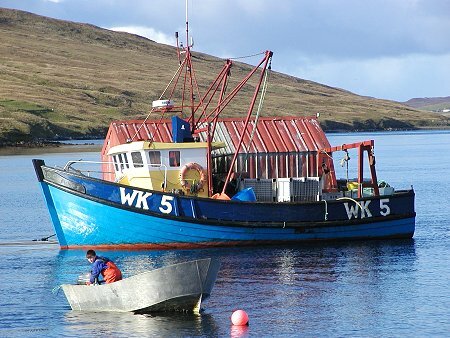 To reach the Atlantic from Voe the vessels based here need to travel the length of Olna Firth before passing the small nearly circular island of Linga, skirting around the south shore of the bridged island of Muckle Roe and past the north ends of the islands of Papa Little and Vementry. Voe is actually about as far from the open sea as it is possible to get in Shetland and a fine example of the way the influence of the sea pervades every part of these islands.